Fans are playing a crucial role in modern technologies of computer cooling. Being the main component of forced air cooling systems, they are widely used in processor coolers, cooling devices for hard drives and video cards, systems units, power units, peripherals etc. In the Part 1 we studied all most important features concerning fans, their fundamental parameters, characteristics and working properties. Today we will look again at such devices, this time from the technical viewpoint and take into account all important technical details. Modern direct-current fans are based on one- or two-phase thyratron motors. Such motors consist of two main parts: control circuit and inductor mechanism. The latter is a rotor-stator tandem where a rotor is an annular permanent magnet and a stator is a four-polar (sometimes 6-polar) inductor. A control circuit can be different. 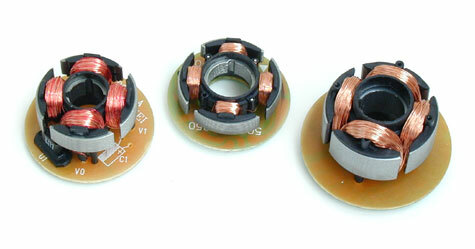 The most popular variant is based on a chip-driver with an integrated Hall device (Analog Technology ATS276/277 chips and their clones are usually used); it fulfills matched inductor's phase switching which allows the latter to induce a rotating magnetic field in the rotor-stator space and make the rotor move. 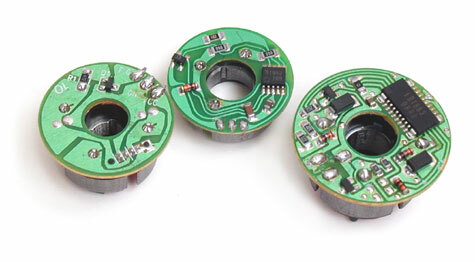 Some advanced fans can use much more complicated and multifunctional chips-drivers coming with a tachometer control, security circuits for a circuit feeder and detection of impeller stoppage (for example, Sanyo LB1663 chip). But such control circuits are not very popular among manufacturers and are rather an exclusion than a rule. Let's start with a sleeve bearing. Not so long ago such bearing was quite popular thanks to its low prime cost and a simple technology of production of such fans: a sleeve bearing is made in the form of a primitive bronze bush, a steel rotor shaft is mounted in the bearing with a plastic locking ring, and the bush is plugged up with two rubber glands attached to the shaft of each its end (the glands prevent grease leakage from the shaft-bearing gap). At first glance, everything looks OK. But if you look closer at a sleeve bearing you will notice several quite sad downsides. First disadvantage. As there is a gap between the bearing's internal surface and the shaft, the impeller's shaft rattles inside the bearing (beating of the shaft is rather noticeable). That is why it makes an abrasive effect on a bearing: its cross section becomes ellipsoidal instead of being round. The shaft begins rotating unstably, its noise level increases (creaking and tapping appears in the fan's noise spectrum), power consumption rises and the fan heats up more. 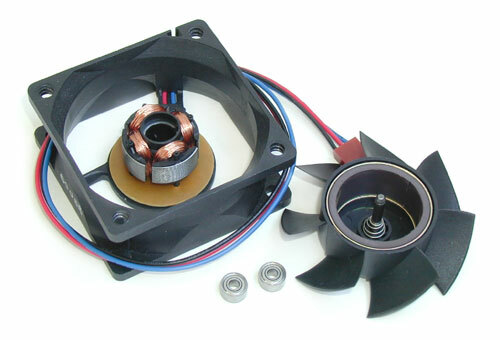 If the impeller is unbalanced, the bearing can get damaged quite quickly and the fan will die. Second disadvantage. Grease can leak out from the shaft-bearing gap (despite glands and other precautions). As a result, the shaft and the bearing run against each other without any grease, the impeller's speed falls down and a noise level increases. Third disadvantage. The shaft-bearing gap is made as narrow as possible to prevent an ellipsoidal shape of the bearing. But if grease inside the bearing is not enough or it's of low quality, the motor starts with difficulty which causes increase in current consumption and power dissipation (sometimes it may result in stoppage of the impeller and damage of the fan). And the fan's service life becomes shorter. Fourth disadvantage. Fans based on sleeve bearings can't stand high ambient temperatures. Over 50-60°C the service life of such fans gets much shorter and usually doesn't exceed 5,000 hours. All these disadvantages coupled with careless attitude toward product quality of certain manufacturers make doubtful usage of fans based on sleeve bearings in computer cooling systems where reliability is of the utmost importance. Such fans are quite cheap, but a greedy man pays twice or even more. Because damage of a fan of a processor's cooler may cause death of the processor itself. Now let's turn to a combined model based on sleeve and ball bearings. I can't say such a combo solves all problems, but it seats on a higher level. First of all, a sleeve bearing plays a subsidiary role (it's used as a shunt). A ball bearing takes the main load. And as rolling friction is less than sliding friction, the motor starts easier and the power dissipated is lower. Secondly, a combined construction is less sensitive to a disbalance of an impeller. The shaft's beatings are reduced to a great degree by a ball bearing, and probability of an ellipsoidal shape of the bush and its damage is minimal (provided that technical regulations at the plant are not neglected and quality of finished products is strictly controlled). At last, the combined fans can work in quite complicated conditions (at high ambient temperatures and increased air humidity). However, the problem of grease leakage from the bush/shaft gap is not solved here, which may result in a slower rotation of the impeller and a higher noise level. Sometimes too sticky or lubricating grease can be used, but they even worsen the situation: grease is pressed out of the gap anyway, or, which is worse, thickens forming hard particles. At worst, a shaft jams, and the fan gets damaged. The last fan we have to estimate today is one based on two ball bearings. Although this construction is not a cure-all, fans on two ball bearings are preferable for processor coolers, power units and system units. The main advantage of a design based on two ball bearings is high reliability and durability of such fans. Two ball bearings excellently supplement each other, provide an easy start of a motor and steady rotation of an impeller. Consumed power of such fans is as a rule lower as compared with products based on a combined bearing or a sleeve one which improves thermal conditions and increases reliability of their operation. Besides, fans based two ball bearings do not require special grease, the problem of grease leakage does not exist. Another advantage - a fan based on two ball bearings is a well balanced construction. A spiral spring set on a shaft between the first bearing and the impeller eliminates a possible disbalance of a rotor, and residual beating of the shaft will be mutually made up for by two ball bearings. As a result, the fan works stably in almost any position relative to the gravity vector. The only disadvantage of such devices is their high cost. But high-quality miniature ball bearings are very complicated and labor-intensive products (one high-precision ball bearing can cost $3-5 and higher while one miniature sleeve bearing is usually not dearer than 10 c). That is why high prices top-quality fans are offered at are inevitable. There is nothing to do. Health of a computer system is anyway more expensive. Well, that's all I had to say about the electromechanical part of fans, and now we are turning to the last crucial technical aspect of an aerodynamic character. Last time we studied one of the most important characteristics of a fan - its performance. This parameter is always specified in the technical documentation of fans and it allows us estimate objectively their effectiveness. But you must remember that the performance is specified for ideal conditions, i.e. when a fan works in the open and there are no any obstacles for an air flow. 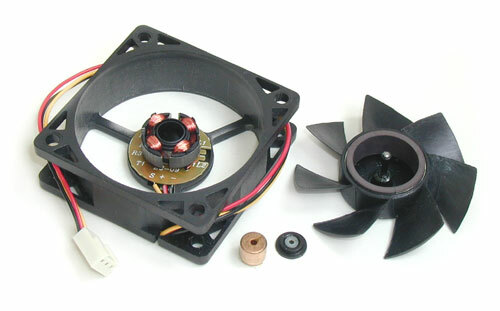 In real conditions a fan is installed inside some system, be it a computer case, a power unit, a heatsink, ai airway etc. All such objects put obstacles in the way of an air flow formed by a fan (flow resistance of a fan's working circuit is different from zero). As a result, a real performance level can be actually much lower than the volume air flow rate which is usually specified on packages of fans, processor coolers etc. Apart from performance any fan possesses one more weighty aerodynamic parameter - static pressure. This value is measured in inches (or millimeters) of water and shows a difference in pressure of an air flow formed by the fan and ambient pressure (atmosphere pressure). There is a clear dependence between the fan's performance and static pressure of its air flow. It is defined in a special pressure chamber and called performance curve (metering characteristic) of a fan. Two extreme values are shown in the technical documentation of manufacturers. Pressure of the air flow at its zero volume rate (zero performance), i.e. when the fan runs idle (no flow at all), is taken as its static pressure. It happens when its resistive action (flow resistance) of the channel is so high that the fan is not able to pump air through this channel. 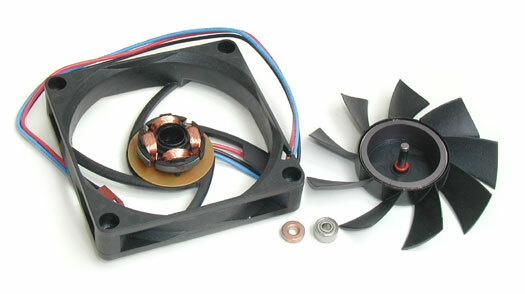 Such situation never occurs in computer cooling, but it can take place in other spheres of application of fans. 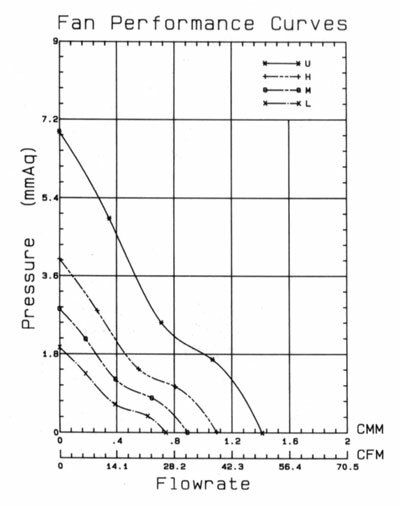 Volume flow rate at the static pressure equal to zero, i.e. when a fan works to its full capacity and gets no obstacles from the channel, is taken as performance. In practice such situation is impossible at all and can be emulated only in a special pressure chamber. Well, let's call it a day, and next time we will continue speaking about a metering characteristic of fans and look at its practical use closely.